A Photographic Guide to Freshwater Fishes of New Zealand. By Stella McQueen Photographs by Rod Morris. A Photographic Guide to Freshwater Fishes of New Zealand by Stella McQueen is a highly illustrated guide to more than 60 species, complete with distribution maps. The book is a school compact size which makes it ideal to take with you as a travelling companion when going on fishing trips. The comprehensive text describes the identification features. Stella McQueen has a postgraduate diploma in freshwater ecology from Massey University. She is also the author of the New Zealand Native Freshwater aquarium. Rod Morris is one of the country’s most talented natural history the publishers and filmmakers and is the author of several books on New Zealand’s wildlife. This is the first comprehensive reference on New Zealand freshwater fishes since the publication of Bob McDowell’s field guide (Heinemann Reed) over 12 years ago. This book includes all freshwater fishes, both introduced and native fishes, with useful identification charts at the back of the book for bullies and whitebait (diadromous galaxiids). Rod Morris has gone to great lengths to capture the very best images and numerous colour photographs through the book will assist in identifying the male and female of the species, and the subtle differences between related fishes. An extensive introduction includes highly topical coverage of freshwater ecology and conservation issues surrounding the quality of New Zealand s waterways, making this book an invaluable information resource. In addition, keen anglers will be delighted to find full entries on trout, salmon, and rudd, including rare hybrids. And mini-maps provided for each entry give an indication of the distribution of each species throughout the country. New Holland Publishers. 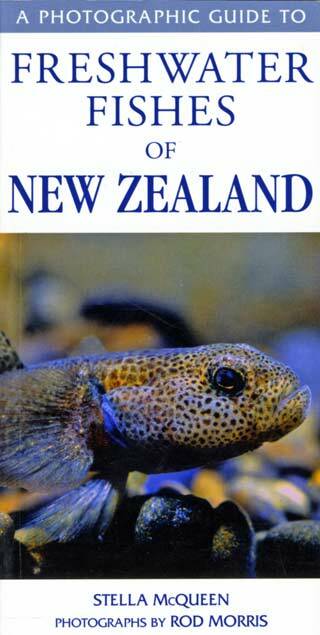 This book is dedicated to Dr Bob McDowall (1939-2011), who made a phenomenal contribution to New Zealand and international ichthyology during the 48-year career.